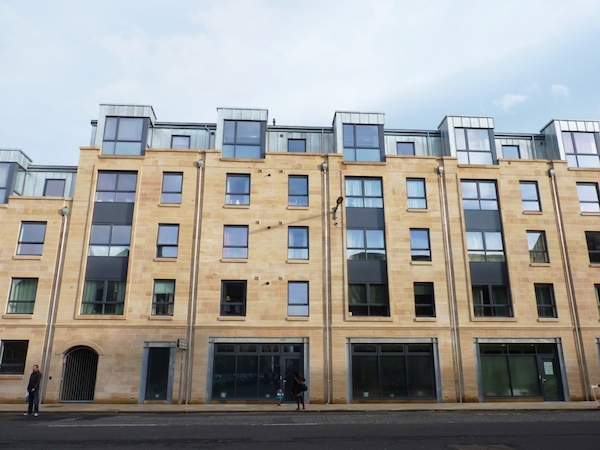 Port of Leith Housing Association’s (PoLHA) Great Junction Street development has been named as one of Inside Housing’s top 50 affordable housing developments. The 32 affordable homes, made up of nine one bedroom and 23 two bedroom properties, have been built for social and mid-market rent and are due to be officially opened later this month. Twenty of the flats are available for social rent, priced at £323 for a one bedroom flat and £358 a month for a two bedroom flat. The remaining 12 homes, available for mid market rent, are priced at £445 a month for a one bedroom and £555 for a two bedroom property. The ground floor has been designed as a large retail unit which is currently leased to local Edinburgh community group The Junction. Keith Anderson, Chief Executive of PoLHA, said:-“We’re delighted to have been recognised as one of Inside Housing’s top 50 affordable housing developments from across the UK. In keeping with the surrounding buildings, the exterior is stone and the properties feature Solar Thermal Heating provided by panels located on the roof. The main contractor was CCG Limited and the architect was EMA. The development was funded by a combination of private finance raised by PoLHA and Government grant allocated by the City of Edinburgh Council. PoLHA is building the mid rent homes on behalf of its wholly owned subsidiary company Persevere Developments Ltd (PDL) which was set up in 2011 to allow the Association to be more innovative in terms of funding and development of this kind. PoLHA owns around 2700 properties throughout Leith and North Edinburgh area and has plans to deliver 400 more new affordable homes over the next few years through the Association and its subsidiary Persevere Developments Limited.